A few weekends ago I traveled with a group of BU students to Port Stephens, a beautiful bay area three hours north of Sydney. We went on a guided day tour including a dolphin watching cruise and a trip to the sand dunes. Port Stephens and Nelson Bay were absolutely gorgeous and it was a great weekend getaway. It was surely an adventure, with highs and lows throughout the day. Although Port Stephens is home to over 100 bottlenose dolphins, we unfortunately didn’t end up seeing any while we were on the boat. Our next stop was Anna Bay and the Stockton Sand Dunes, the largest moving dunes in the Southern Hemisphere. You would think you were in the middle of the desert as camels appeared in the distance, but we were right by the beach. While at the sand dunes, we had the option of going sandboarding or camel riding. 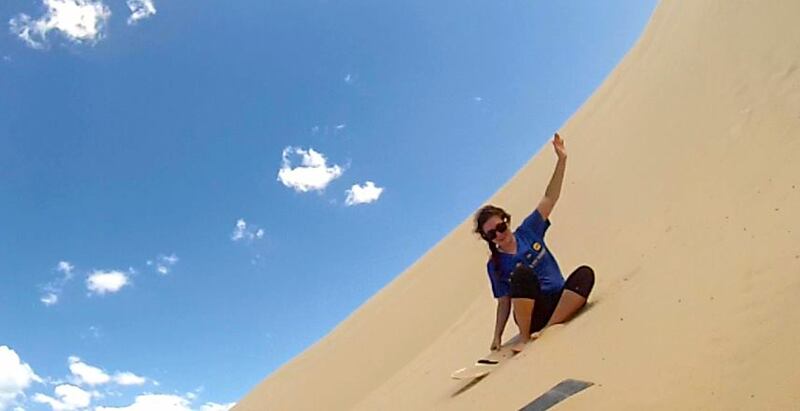 I chose to do sandboarding, which on any other day would have been a blast, but we faced many difficulties with the 20-30 mph winds blowing sand in our faces. It was a challenge getting up the dunes and not getting sand in our eyes, but we did manage to fit in at least two slides down the sand dunes before we left. I think it’s probably taken a good two weeks to get all the sand out of my hair but it was worth it. It would have been nice to have some more time in the Port Stephens area since it did involve six hours of travel. Nevertheless, it was something unique to experience in my time here and I would suggest going there at some point for anyone who is studying abroad in Sydney. It is always worth looking into different tour groups to see which ones offer the most for the least amount of money, or that fit your budget and time frame. During my time here, I’ve learned that there are a bunch of great places in and around Sydney that host fun adventures for day trips or weekend trips, depending on how much you want to get out of the experience. It’s always nice having just a little time every once in a while to go out explore and take a break from all of the hard work you’ve done over the semester. With less than two weeks left here in Sydney, I am trying to fit in as many of those little adventures as possible!